as they looked to protect their proud, unbeaten home record in the league this season . Early on in the game Oldham controlled field position and they had the lion’s share of possession as Garstang were forced to battle for their lives just to stay in the game. The defence was solid though and it took Oldham until the midway point in the half to breach it and take the lead with the opening try (0-5). Despite having been on the back foot throughout the half, Garstang finished it strongly as they finally managed to get a decent share of possession and they were rewarded with a penalty under the posts just before the break. McLennan slotted the kick over and Garstang went in just two points behind (3-5). Garstang had to be pleased with the way that they had worked their way back into the game but they wasted all the good work with a catastrophic start to the second half. They failed to deal with the kick off and from the subsequent scrum Oldham crafted an opportunity for one of their backs to ghost through the defence and score Within a couple of minutes things got even worse. A poor clearance kick was gathered by their burly centre and he cut past some weak defending to race through and score another try for the visitors (3-19). In the first period Oldham had been forced to work their socks off to get any points on the board but straight away they had been gifted two relatively soft tries. These scores looked to have taken the pressure off them and they were playing on the front foot with more freedom and they soon scored their fourth try of the afternoon. 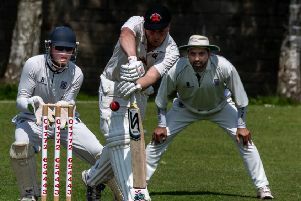 By this stage Garstang had introduced the experienced duo of Graeme Slater and Ainsley Pye into the fold and they began to get a certain amount of dominance around the field. Midway through the half the team got another rolling maul going and they marched the ball thirty metres down field to score in the corner through Max It was now all Garstang and with ten minutes to play Oldham were a man down as their influential Stand Off was despatched to the sin bin for a high tackle. Almost immediately Garstang reduced the arrears even further as Greg Billington forced his way over under the posts (15-24). The healthy crowd were right behind the team by now and with two minutes to play Garstang began to believe they could nick an epic win when Ben Kelsall forced his way over in the corner (20-24). Oldham were hanging on now and Garstang were rampant. They believed they could win and from the kick off they roared back at their opposition with ball in hand. The ball was spread wide and a try looked on the cards but desperate Oldham defence just about kept them in it and they hung on to seal the win. Garstang know that they left themselves with too much to do at the end but they can be proud of their late efforts which saw them secure a losing bonus point. Team: Kenyon, Gunn, Whitaker, Everest, Haley, Billington, Kelsall (c), O’Brien, Barton, Dawson, Rowbottom, McLennan, Dugdale, Robinson, Davies. On Saturday the 1st XV travel to play St Edward’s Old Boys and the Blues are at home to Vale of Lune 3rds. Both games kick off at 15:00.